Hi Sis Oz, can you add me sa Viber? Here is my number 09215364464…just have few questions lng. Sis Mara, what happened to the call you recieved from the embassy? Did u get ur visa already? @Sis Lara, wasn’t sure if that number was from the Asutralian Embassy. 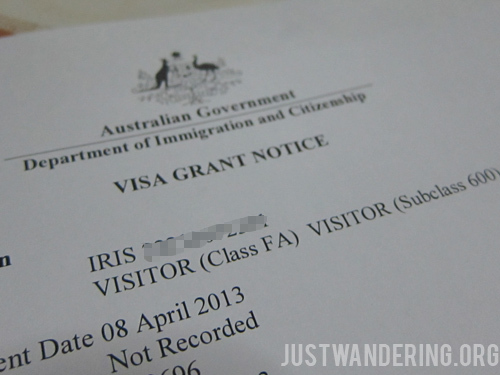 ..havent got my grant visa yet…a month today since applied. Hoping for positive result though. @sis Mara, okay sis. Maybe this week or next week u’ll get ur visa. I thought uve got ur result already. Im still waiting and hoping for a good result. May fb ka sis? Yes sis Lara…my viber ka? Here is my number 09215364464 just kindly add me then I’ll add you in fb if you want. Sis Mara,sent u a message on viber. Hope u get it. @sis mara,i added u on viber. Hope u get my message. @sis Lara, walang msg sis…hindi ko natangap. Hi josephine tanong ko lang how many days bago dumating sakin yung notice of visa since the embassy called me last june 22 na grant nadaw visa ko? I didn’t emai the embassy because they said not to follow up applications unless they contact you. Im worried now…it is my 3rd time to apply though and fortunately all my aplications naman was granted. Hoping next week, darating na. Sis mara, anu nga uli ung number. Coz last time i think embassy have this last 3 digit tel # 100. I sent u message on viber. I thought u got it. Darating rin yan sis. Hi! I contacted VFS via phone and the embassy via e-mail cause worried din ako. Sabi nila pareho average processing time is 1 month, kaso ngayon ata 4-6 weeks kaya within the processing time pa din daw. Baka next week? Hi Mel,kelan ka ng.lodge? Via vfs ka rin? Medyo matagal processing time. Nka2.kaba mghintay. Hope u dont mind if i ask when ung flight mo pa oz. @sis Mel,sayang sis. Bakit kaya matagal processing time nla. Almost 1 month na sau. Cguro next week meron na kaung result. Pang.ilang beses mo nang apply ito? Nauna kau sa akin, medyo matagal pa ung hihintayin ko. Hi Mara, yes you can email them lalo na kung past 30days na. Un ginawa ko. I wrote my experience it sa ginawa kong post. Minsan kasi siguro sa dami ng application baka kailangan din nila ng reminder. Alam mo nmn nsa Pinas. Hi Trish, I do not know the answer to your question. It would be best if you contact VFS directly and ask them. Hi sis Mara kaya pala they are trying to rang u sis kasi pang 3rd time muna. Sa akin pang 2nd time ko apply tumawag. Anyway granted naman yon.baka my mga itatanong lang. Bf mo ba puntahan mo dito Aus sis? Cheers. @Sis Josephine, Sister ko pupuntahan ko sis…hopefully they will grant it. Maybe next week nandyan na. Goodluck sis Mara. Buti pala my sister ka dito sa Aus. @sis Mel,tama sis. Hoping for a grant visa from them. Iba lng tlaga ung process doon. First apply ko rin to. San ka sa OZ sis? Sino pupuntahan mo? @Lara, wala pang definite plans kasi ayoko magplan na hindi pa sure yung visa. Ikaw? @Mel,same din. Wla pa din akong ticket. Mas mganda kase pg.sure nah. im traveling this coming june 15 with my daughter going to melbourne hope dile strikto ang taga cathay pacific airways,patinarin ang immigration….first time ko panaman bumyahe sana ok lang ang lahat anu bang kadalasan hinahanap nila na dapat kong ihanda at ipakita sakanila sana po may makapagsabi sakin dito para ma aware ako sa lahat ng oras maraming salamat po…. Hi. May I ask how do you follow up the visa application status through email? What is the email add and details needed? I lodged my application last may 10 through VFS. TIA. Hello Miss Nina, would like to ask sana, if you go to New Zealand from Australia and spend some time there and go back to Australia again after some days, don’t you need a tourist visa for NZ? Thanks! You need a visa for New Zealand, and youv have to apply while you are still in the Philippines. You can apply through VFS. I see. So just to clarify, you have to apply for Australia and for NZ visas separately, yes? Thanks Miss Nina! Yes. As pointed out, you need to have a multiple entry visa if you are going back to Australia. I will be writing about how to apply for a New Zealand visa soon. Ms. Nina, btw, do you have any idea if we can apply as well to NZ even my sponsor will be Australian? Based on what I’ve read in their requirements, you need to be able to prove that you are a genuine tourist — meaning you have the means and intent to leave New Zealand. Ofcourse you need another visa for NZ because that’s two different country unless you are Australian citizen or PR, as far as I know you won’t need Visa to NZ. And if not, you need to have multiple visa to Australia because you will be entering AU again. Hi just want to share that i got my visa granted today. I lodged last may 11. It is my second time and this time i requested multi entry and it was granted. Multi entry until june 2017. So happy! Hi Kim! Thank you for sharing this! Lodged ours last May 13 via VFS. Almost the same time tayo nag apply. Hopefully we got ours na din within this week. Btw, did you follow up or you just waited? Yes this week meron n yan. Oo ng mail ako last week.. Sana dumating n din result nun sa inyo. Hi Monica. We lodged the same date. Have you got yours? May I know the e-mail address? Did you provide any details? Kim — Thank you! Nope, wala pa.
She — Hi! Nope, no results yet You? Visa Granted, One year multiple entry! That’s exactly one month. Thanks to those who helped! May i ask if you have an idea about CFO’s? Does it apply to tourist visa (visitng husband) ? Sorry, that doesn’t apply to me, so I’m not sure if that is required. But from what I understand it’s for those migrating, not for tourist. Anyone in Brisbane Toowoomba? Arrived here last June 2 at super super lamig up here…. Hi Trixie.. kahit dito sa nairne South australia ang lamig din ehe.. ? Trish,sent u a message on fb messenger dont know u got it. Cant add u seems that ur fb is private. Anu i.aadd mo na docs? I think pwede mo ata i.send thru email sa help line ng embassy. Not sure. Hi sis Shane Gudluck sis.God Bless. Can you please share what did you do? What documents did you submit? Hi sis.. online ako nag extend.. same Lang din sa pag apply ng tv. Kong meron kanang immiaccount madali nalang yan Sis… diko din alam pero nag ask ako kay Sis josephine …ang hiningi lang sakin na docs passport and bcertificate. .un lang ang attach ko sa online ko. Kasi meron nmn na dati ung mga papers ko.. sagutan mu lang ulit ung mga question dun..
Hi! Lodged our application via VFS last May 13. I was reviewing the docs we submitted and noticed that we forgot to include evidence of relationship to our relative (not sponsored, just invitation letter/statutory declaration). Is it possible to submit additional documents? I called VFS and they said we can but there’s a 400+ pesos charge and we are to submit it to their office and they don’t have e-mail options. But then on the website of the Australian embassy, it says that I can submit additional docs via e-mail (http://philippines.embassy.gov.au/mnla/After_You_Apply2.html). Any help/response on this is highly appreciated. Done my medical mga sis.. naku madali lang ang medical. Mas mahirap pa sa pinas sa mga medical dun.. dito so easy. Hindi nakakatakot.. friendly mga doctors ..
yong medical mo ba ay x-ray lang? or nagpa laboratory ka pa shane?.. thankz! Godbless! Hi sis sensya na late reply..yup sis… xray..eye test..BP. .skin…lahat Sis. . Urine test.. and ask ka nila if want mo mag pa bloodtest kasi not included un..iba ang bayad…pero sabi ung Blood test daw good for 1 year if mag apply ka ng pv sa future.. madali lang Sis. . Wag u kabahan friendly mga doctors.. pero depend cguro wat area ka. Hi sis rose yes need tlga magbayad 1 thousand plus ang travel tax and 550 ang terminal fee…..
Hi miss rose, sa PAL kasi ako nagbooked at wala na ako binayaran pa na terminal fee at tax.. included na lahat sa binayaran kong plane ticket. Buti pa ang PAL Cathay pacific kasi sasakyan namin sana pareholang din sa pal. Mga Sis! Thanks sa blog na to…it really helps. Got my multiple visa today good for 1 year. I applied last May 3 and took them 38 days…they didn’t emai me but they sent the grant thru mail. Sa mga waiting, kayo na next just be patient and keep on praying. Wow. Congrats sis Mara. Lucky you. Hopefully maging okay rin ung result ng application ko. Congrats Mara, Is it your first time to apply? Hi Anne, I can send u mine ,it was just a very simple letter ..but anyhow it was granted anyway.. I can send I to u, dobi have your email already? Hi April ,u only need your passport of course ,your printed granted visa, and your itinerary return tickets, immigration officer most ask you some questions but just those basic ones like address where u going ..
Queensland din po ako…sana sa Queensland? No worries ,there’s no interview sometimes they will just ask you some questions, they can’t stop u of going Oz coz u have got your granted visa anyway …so nothing to worry about just be confident ..
What is that PAI u have mentioned? If youre talking about Pal flights , not strict , passengers is there business so just obey the rules though , if youre bringing extra kg.of baggabe considering of what u have booked then you’ll pay the extra, 7 kg for hand carry.. No liquids more than 10ml allowed in the handcarry …Not strict actually . No april u don’t need any show money :-) u can do it all by yourself you’re a big girl Na… Try it it’s nice to be on your own for the first time it’s challenging…. No worries, if u need further questions just email me nalang escepadilla@gmail.com..seeyah! Is there anyone here who have flight on june 18 via cebu pac to sydney? Hi sis buti multiple su.anu2x docs sinubmit no sis? Hi Mj are u in Au Na? Hi,Claudia!San ka sa oz ,sis? May viber ka?Dito ako Brisbane now. Sis,Nag apply ka ng extension?May viber ka ba? Hi mga sis! Ask ko lang if may nakaexperience na. I applied for 3 months tv may 18, received by embassy may 19, then may 27 they asked me to do medical. May history kc ako ng TB at sinabi ko naman sa form. I even sent old medical clearances. Tinapos ko yung medical and St Luke’s told me na ifoforward na nila sa embassy. Pero up to now wala pa ding email from immi. Tanong ko lang, nung hiningan ako ng medical ibig sabihin ba nun na as long as macomply ko yun eh maapprove visa ko? Kc bakit pa nila ako hihingan ng medical Kung denied din naman pala. Praning na ko, pls enlighten me. Hi Blanca , the medical is mandatory as part of application. it depends s case officer at it depends s docs n pinasa mo if complete…nirequest ka po magpamedical kc po required yun….stay positive po…..
Wanna share my happiness mga sis.. my extensyon visa just granted today.. applied June 7.medical June 9..granted June 17.. I’m so happy… .. god always good. Hi,Shane! San ka sa Oz? May viber ka ba? Pwede ko makuha number mo? Hi sis.. dito me perth.. Ikaw? ? Hi,Shane! May viber ka ba? Pwede add mo ako 0406769466..Pa help sana ako about visa extension.? im so much happy that finally were here now in melbourne its our 3days already here now and it was really super cold…….hoping for those who are still waiting for there visa just keep praying god will help you,,,,,to grant your visa,dont lost hope. San ka nag apply?? Online ba Sis? ? At sa sis natin na nag message sa fb ko kung ano sinubmit ko during my extension tv. Dito ko nalang din e post para malaman din sa iba nating ka sis. Yong sinubmit ko na docs, same parin noong nag apply ko sa Pinas. Yong binago ko lang yong extension letter ko why tayo mag extend. At yong nag aaply na ng thru online sa Pinas, yong required nalang if mag extend dito if online din yong passport natin at birth certificate. At my tanong doon bakit ka mag extend? Anong month and date end ng extension ang hanggang kelan extension mo na request mo. Thanks a lot. GOD BLESS US!!!! Thanks sis Josephine and to all.. siguro nanibago lng ako kase yung visa ko sa Pinas 2 weeks lng grant na haha now I feel now for our other sissies dito na sobrang tahal nghintay sa visa nila pero worth it nmn kase granted. Hi! What are the document requirements ‘pag student yung mag-aapply? Since wala namang ITR or bank statement. Same documents, the applicants required to get the University certificate / enrolled form to prove u are student.. Thanks to this blog for making me calm whenever I read comments na approve. I’m so happy, also thanks to this blog for guiding me with everything! Only 2 weeks of waiting and this is my first time. God is good! Hi sis pwede malaman kng ano mga sinubmit mo? At ngrant kpo ng 2weeks? Thank you..
Hello, same din lang po sa lahat ng andito sa blog pero with insurance letter from the lawyer and may fee po ako na binayad. Yes po 2 weeks lang. Based on the refusal letter not enough evidence of coming back daw pero nag submit naman ako ng complete req. Are u in Stralya now Shane? Hi sis.. stralya? Dito me perth Sis. . Correct! Hehe, super helpful talaga ng blog na to. Oh Perth ,would love to visit one day! Stralya ! We just used it for weird slang of Australia Shane. What’s best airline to use? Suggestions please! Hi Luise lahat ren ng pinass kong pictures hindi scanned since phone pictures naman lahat. As for documents scanned lang & walang kahit isang notarized/witnessed. I suggest mag email ka na sa kanila lalo na kung patapos or tapos na bridging otherwise kailangan ng compelling reason bakit hindi ka um-exit. I applied Nov 18, Bridging Visa granted 30 minutes later – Extension granted Nov 25. Currently applying for onshore PV. Hi sis.. san ka nag apply online ba?? Or VFS. .kasi ung akin..nag apply ako June 7 after ko magbayad dumating na bridging ko.. Kinabukasan nag email cla ng medical.. tapos June 9 nag medical ako.. and june 17 ..granted na extensyon ko.. ang tagal nmn sau Sis… if online ka baka meron kang hindi na sagutan dun Sis. ..check mo.ung docs nga lang na attach ko passport and bcertificate lang kasi un lang nmn ang Ask nila..kasi online naku datI sa unang tv ko.. pati ung isang Sis na nag ask sakin last week lang nag apply .. granted na daw kahapon..
Hello po .. pahelp naman please .. first time ko na mag process ng TV ko .. pero hindi sya online bali ung boyfriend ko ang mag sponsor saakin then may cousin sya na nag wowork sa immigration … as per his cousin need ng assest ang may work .. since nag resigned na ako sa work ko last year unemployed na po ako .. then ang assets ko lang bank acct ko .. possible po kayang magrant kahit unemployed ??? Thank you ! Hey again April , u must have return tickets, otherwise u get into questions and get u delayed.. In my experience hindi nila hiningi na may return ticket ka. If ever pwede mo naman sabihin na tourist ka & nag de decide pa kayo ng BF mo kung pupunta kayo sa ibang state tas from there ka uuwi. So sayang lang ticket. Good luck! Wala akong return ticket.. ask ng immigration bat daw wala.. sabi ko kasi balak ng bf ko magbakasyon dito pinas kaya dun na kami bili sa oz. Un reason ko Sis. Hello po, what airline did you use? Tyaka matagal ba po kayo quinestion? hello po i just want to asked may visa grant yesterday june 22 and its 3mos stay but its say there last day of arrival decmber 22. it single entries ang ibig pong sabihin dun na valid po yung visa ko po tell decmber 22.?? but i can stay only 3mos?? Yes po, valid po visa mo til december 22 kung di ka pa po nakaka enter, pero once u enter from the date na dumating kayo 3 months valid from their. Same tayo June 22 to December 22 validity. Hi! Via email mo ba nareceive ang visa grant notice mo or post mail?..thank you..
What airline did you use po? Anu reason bat na refused ka Sis? ?